When a customer leaves an item in their shopping cart, you may want to follow up to remind them to purchase the item they left behind. After you set up an abandoned cart series, we'll send a sequence of reminders to encourage your customers to come back and complete their purchase. In this article, you'll learn how to create an abandoned cart series. The abandoned cart series is available to users who connect a supported e-commerce store or custom API 3.0 integration. To find out if your store supports this automation, visit the Connected Sites page, click the name of your integration, and check the Features list. You can only have one abandoned cart series per connected store. If you manage multiple stores, you can create one abandoned cart series for each. To make sure your customers don't receive redundant emails, we recommend you disable abandoned cart automations created outside Mailchimp. Customers who provide their email address in your connected store, but don't opt-in to receive marketing emails from you, are added to the transactional portion of your Mailchimp list. For compliance reasons, these recipients will only receive the first email in the abandoned cart series. To create the abandoned cart series, follow these steps. Enter a campaign name, select a store, and click Begin. Now you're ready to personalize and design your email content. In the Emails step of the Automation Builder, you'll add or remove emails in your automation and design each email's content. You can also edit each individual email's settings. The abandoned cart series includes three emails, but you can add or remove emails, or change the settings for each. The default automation features emails with the following triggers. 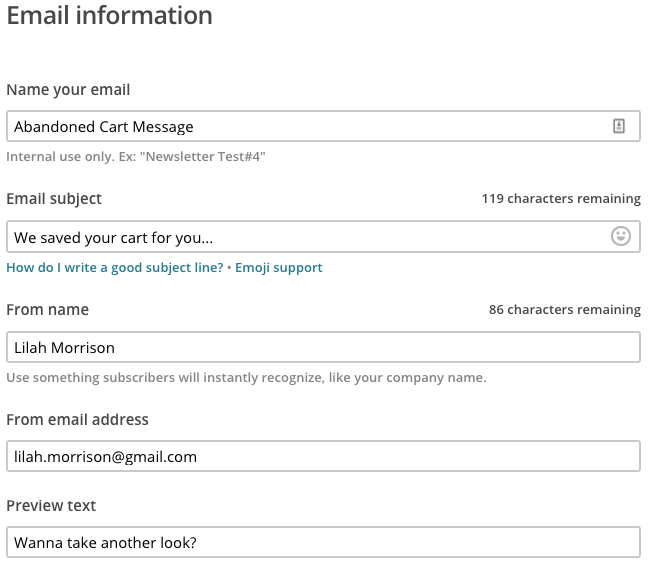 To design an email in your abandoned cart series, follow these steps. On the Setup step, input the field names for Name your email, Email subject, Preview Text, From name, and From email address for the specific email you're working with. On the Template step, select your template. Our abandoned cart email templates include a default logo placeholder and a Cart content block, which inserts the abandoned item into the follow-up emails. If you choose another template, be sure to drag a Cart content block into the email layout. On the Design step, design your campaign. Click Save and Return to return to your automation timeline. To change the trigger, delay, schedule, segment, or activity settings, edit the automation on the Emails step of the Automation Builder. Your overall automation workflow settings include your Workflow name, From name, From email address, and tracking options. To access your workflow settings, navigate to the Emails step of the Automation Builder and click Edit Workflow Settings. The Confirm step is where you'll review your automation. Review the checklist, and test each of your emails if you haven't already. Click Resolve or Edit to make changes to any section of the automation. When you're ready, click Start Workflow. Success! Now, if a customer leaves an item in their shopping cart, we'll automatically send them your abandoned cart series. Send an email to customers who add items to their cart but don't check out. Recover lost sales for your e-commerce store. Learn how to set up Mailchimp for Magento. Add customers and order information from your Magento store to your Mailchimp List. Learn how to connect your BigCommerce store to Mailchimp. Use purchase data to build segments and send targeted email campaigns.